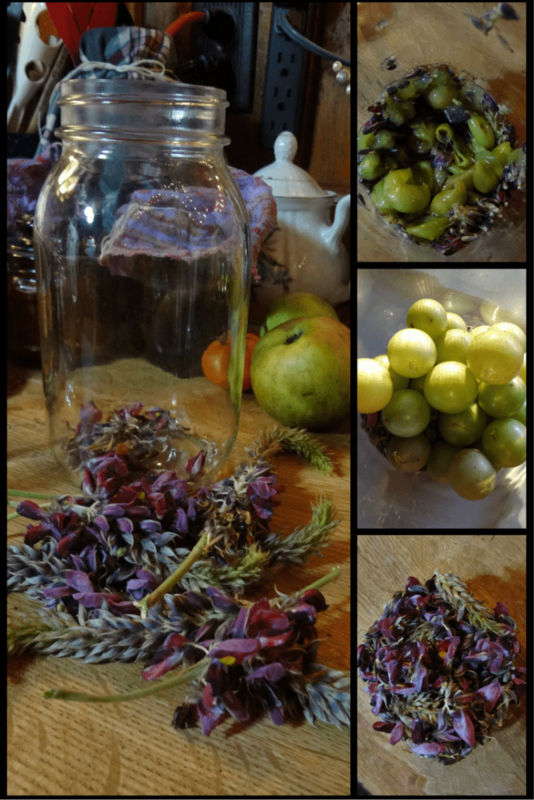 I went foraging in downtown Asheville, right smack dab in the middle of the city. 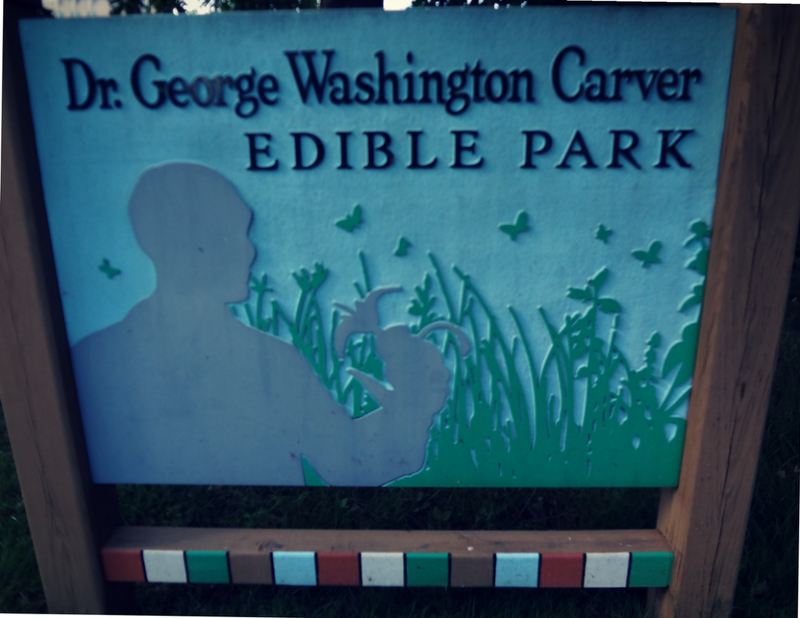 Normally, urban foraging isn’t my favorite way to gather edible weeds and fruit because of the traffic and residual pollution, but Asheville is lucky enough to have an edible garden, the George Washington Carver Edible Park. The park is connected to the Stephens-Lee recreational center, and you follow a small, meandering path down past apple trees, pear trees, walnuts, chestnuts, and fig trees. I could see evidence of earlier spring and summer plants now past their season: many kinds of berry brambles were wild in the undergrowth! This was my first time visiting the park, and when next I return, I plan on bringing some pruners and a rake. The garden needs a bit of love. The kudzu and poke is taking over, threatening even the bright and beautiful walls of muscadine grapes! I’d hate for someone unfamiliar with foraging to see the shiny red-purple-black poke berries and mistake them for something safe to eat! The grapes are taking over the fence at the basketball courts, all the way up the very tall chain link fence. The spot is in full sun in afternoon, and those grapes are quite happy! Most of the ripe bunches were hidden in the shade behind the large leaves, so it looked like it was bare of fruit at first. Once we got the hang of it, we gathered a few pints pretty quickly. I got on Eric’s shoulders to reach a few choice bunches that were out of our reach. He’s brave, as I am rather clumsy! 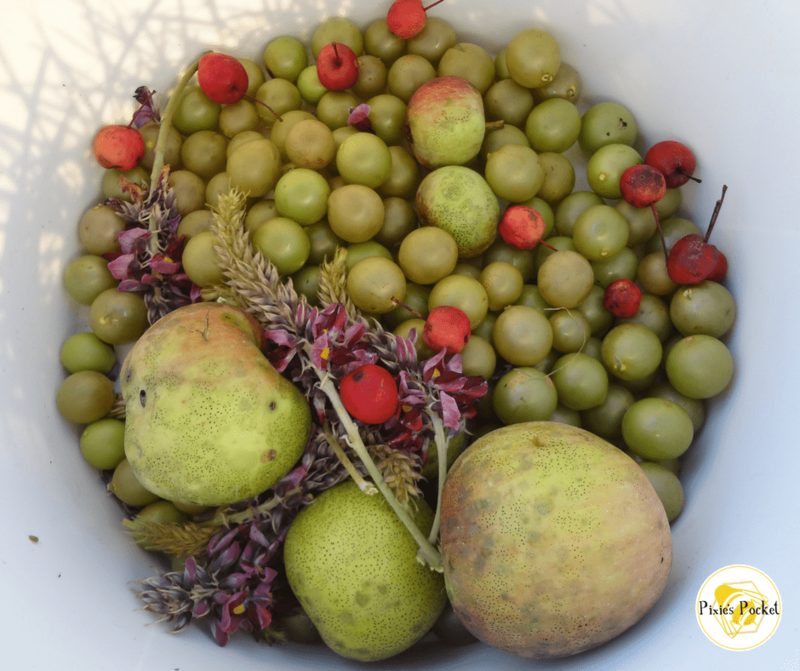 So, with my bucket full of goodies well in hand, I headed home and tried to decide what to make with my foraged fruit. One big batch of apple and grape jelly? A weird booze? Maybe just snack on the fresh fruit and try to eat it all up? I did not have enough grapes for a gallon of wine. I had never worked with kudzu flowers but knew they were edible. There weren’t enough apples to do much with except for enjoying them in slices with honey and peanut butter! But I kept getting seduced by the grape-candy scent of the kudzu flowers, taking big whiffs as I munched on the muscadines. The two flavors wanted so badly to be wine that I decided to give it a whirl. Here is my first attempt at a small-batch mason jar of wine! 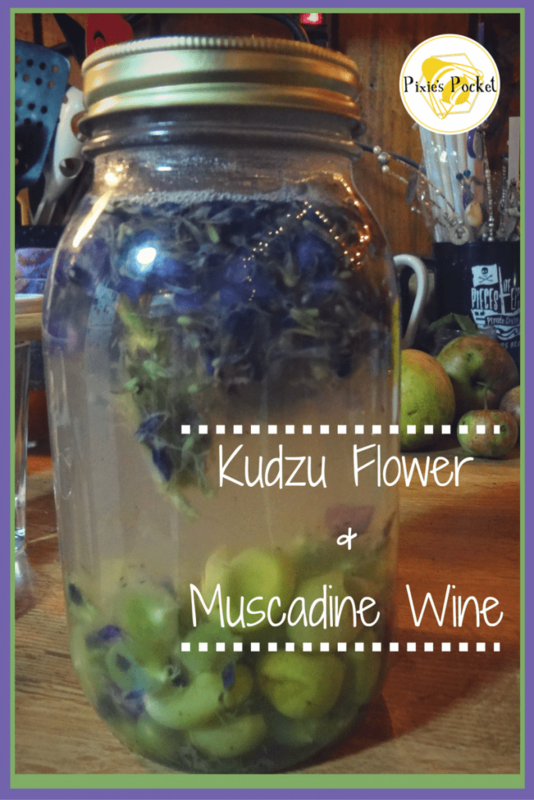 I stripped the kudzu flowers from the stem and added them into the jar. Next went in two large handfuls of grapes. Once they were all in there, I smashed the everloving hell out of the whole thing with a wooden spoon, making sure each and every grape was popped! That’s a very enjoyable part of the process, I must say. Next, I poured the sugar on top of the grape-flower mash and gave it a bit of a stir. While that was going on, I boiled a kettle of water. When it was ready, I poured it over the grapes and flowers and stirred it to ensure the sugar was dissolved. I then added a lid with an airlock. At that point, I realized that I’d likely killed off any wild yeasts with the boiling water, and sighed. Use warm water instead and the wild yeasts will do their job! Once the mixture was cool, I stole a taste – delicious! Grapey and sweet and very flowery. Since I had killed off the yeast, I needed to add something to start the fermentation, so I added a splash of homemade cider that I keep in my fridge. The bottle is full of yeast, and sure enough, it kicked my little experiment into life a day or so later! The liquid turned from a lovely lavender-grey into a luscious purple over the next day or two. ← Things I Love: August! Sweet August!